The big problem with personal defense rounds for rifles is that they’re expensive. 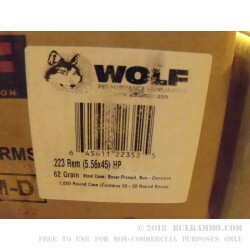 Wolf has solved that problem with their non-corrosive, steel case, 62 grain hollow point. Now all the benefits of a hollow point rifle round are available at a price that means you can actually afford to do more than just zero your rifle with them. 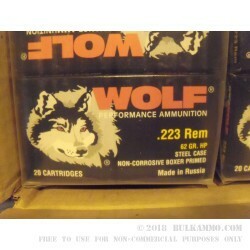 At 2900 feet per second, these rounds are also legal for use in some states to take up to medium sized game. Just make sure you know your local laws before proceeding. 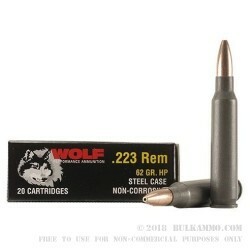 These rounds would also make a great option for hunting wild hogs or for personal defense. 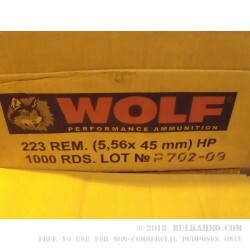 Packed in a sealed case of 500 rounds, these Wolf .223 Remington rounds are made to stand the test of time...or bet shot as soon as they show up.